We provide professional delivery and installation services. 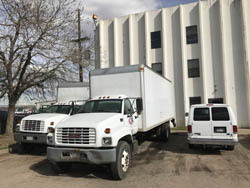 We have the tools and vehicles to get the job done quickly and safely. Deliveries and installations are typically in the Colorado front-range area, but we occasionally go out of state as well. As installers, we have worked with many different types of furniture, equipment, office cubicles, etc. - even pre-fab drywall systems (we are a dealer/installer for A-wall). Our installers are courteous and pleasant to deal with, and we make sure the job is done right. We want our customers happy, and we go the extra mile to help make sure things look the best they can. We are very experienced designers, movers, and installers! Teknion, Herman Miller, Hayworth, Kimball, HON, BPI, Steelcase, Knoll, etc. - pallet rack, shelving, various machinery, etc..
- Pre-Engineered In-Plant Buildings - portable buildings, cleanrooms, security booths, etc.